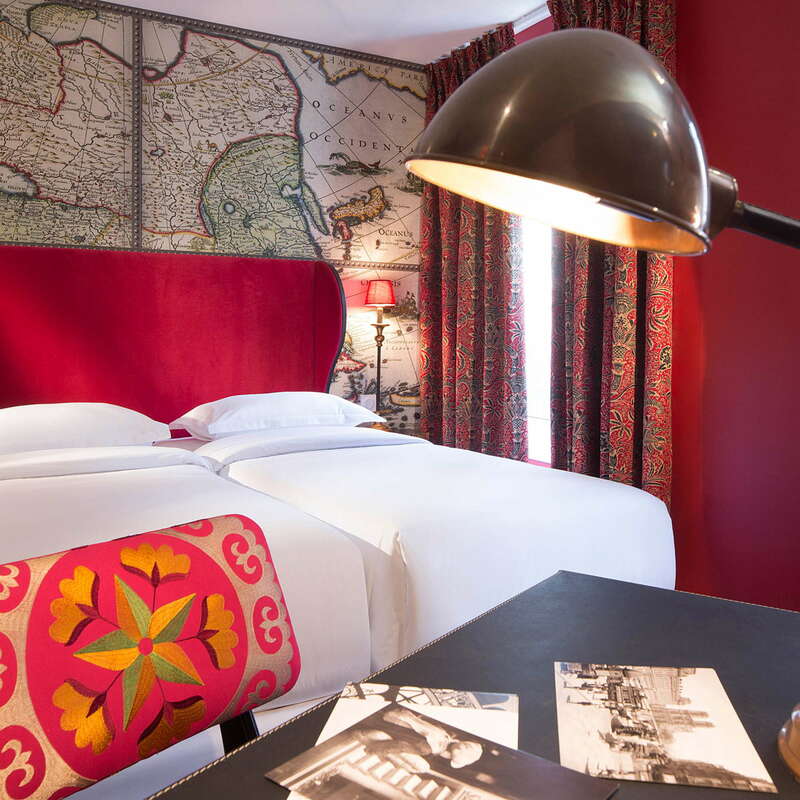 This spirited boutique hotel set on a quiet, elegant street in the beating heart of Paris bears the signature of fashion designer Christian Lacroix. Like the continents they represent, each of the hotel’s 25 compact travel-themed rooms is unique, in sizes XS, SM and XL, which must be tongue in cheek, since all the rooms are cozy with a capital C. But for style, price and, most of all, location, this exuberant hotel is indeed fabulous. YOU SHOULD KNOW If you’re sensitive to clashing patterns and colors, be sure to study the website photos to be sure this is the place for you. 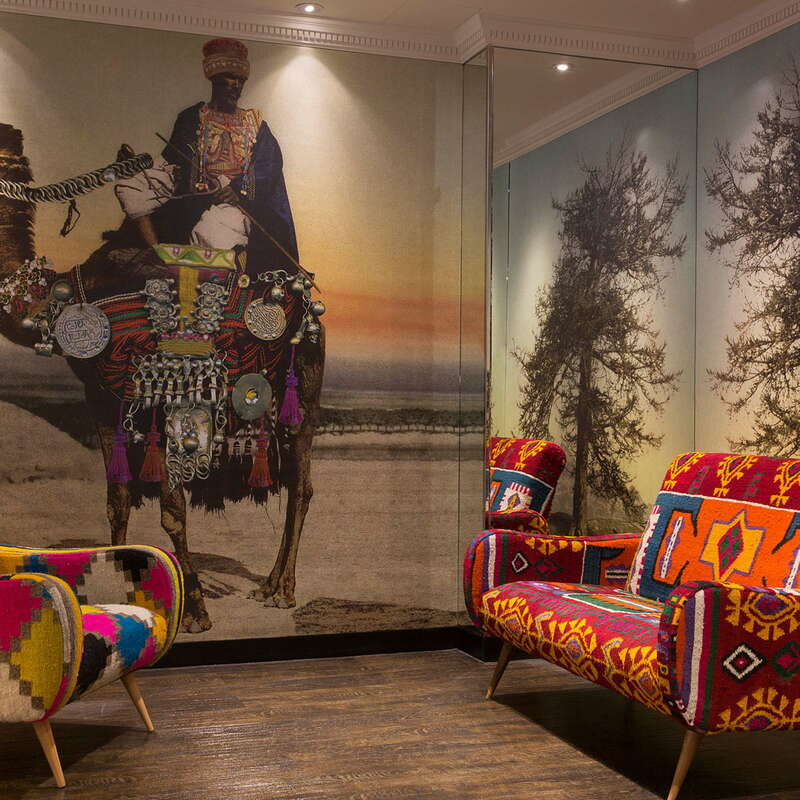 Decked out in a riot of colors, motifs and fabrics that evoke one of six continents, rooms can be viewed as delightfully lively or clashing and overwhelming. Chic furnishings are the height of quality and beds are dreamily comfortable. Though small, you’ll find all the basic amenities: minibar, A/C, safe, robes. YOU SHOULD KNOW While there are no Nespresso machines in rooms, coffee is available all day at the lobby honor bar for a small fee. Expressing themselves in tiles of different sizes and colors, bathrooms are spotless, equipped with modern fixtures and are chic right down to the Missoni bath products. Bathrobes and slippers are included (not always the case in a 3-star hotel). 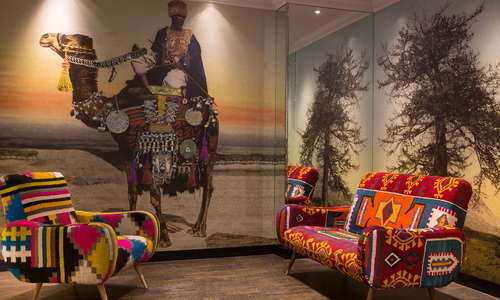 Small and wildly colorful, the lobby offers a small lounge area with comfortable seating for curling up with a free newspaper or magazine while sipping a coffee or drink from the honor bar. A buffet-style continental breakfast (of course), with fresh croissants, bread and jam, yogurt, fruit, juice, is served in a compact, cheerful dining room downstairs. If you feel like getting out for breakfast, Ladurée’s historic 19th-century café and patisserie is just minutes away on the rue Royal. 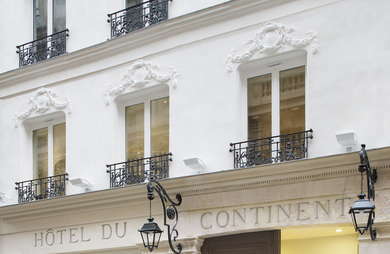 Or, around the corner on the rue de Rivoli lies the legendary Angelina, home of some of Paris’s best chocolat chaud. You’re also one minute from a small branch of Pierre Hermé, Paris’s star pastry chef, and Jean-Paul Hévin, a top chocolatier-pâtissièr, so prudence is not advised! At the lobby's small honor bar you can enjoy a glass of wine or a soft drink from the afternoon well into the evening. Upscale territory to be sure, but chic enough not to qualify as stuffy, as you're smack dab in the middle of some of the city's most upscale shopping on the rue Saint-Honoré. 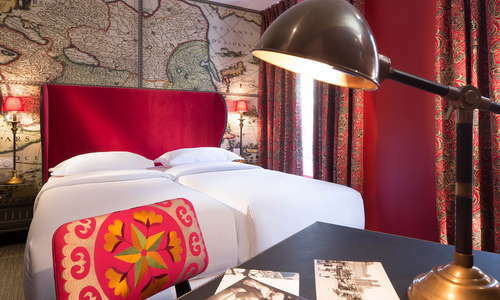 In the heart of Paris, close to Palais Royal, Othe Tuileries, Place Vendôme, Opéra Garnier, the Louvre, L'Orangerie (displaying Monet's Waterlilies, this is an exceptionally convenient neighborhood to tons of Paris's top sites and museums. This is ground zero for Paris's storied hotel bars, starting with Le Meurice's Bar 228 piano bar and the legendary Hemingway Bar at the Ritz—both helmed by a famous Parisian barman. Winner in our book for most gorgeous nightspot, the newly restored Le Crillon Hôtel's Les Ambassadeurs is resplendent (all within a 5-10-minute walk). For something a bit more prosaic, head toward the Palais Royal gardens to Willie's Wine Bar or Verjus Bar à Vins, both favorite expat hangouts with good food and a congenial atmosphere (15-minute walk). 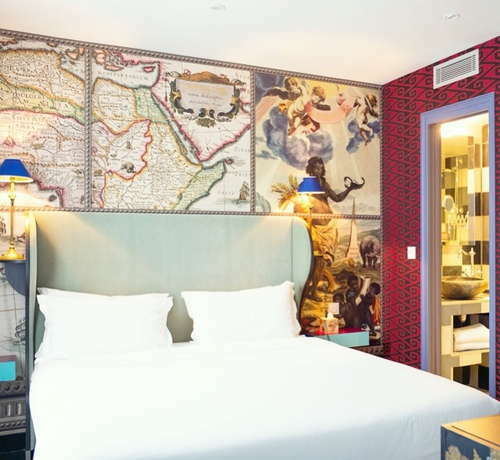 What says Paris more than a cozy, super-chic hotel full of luxurious touches by a haute-couture designer in a neighborhood at the heart of it all? You may never want to leave, but when you do, you’ll be within minutes of some of Paris’s best shopping and sightseeing— enjoy!